Buy the tiniest hearing instrument from hearing aid centre in West Tambaram so that no one will ever notice you wearing a hearing aid rather be surprised enjoying life more. We deliver IPhone Hearing aids, Custom styled hearing aids crafted to suit individual need. We have improved hearing and communication lives of people in West Tambaram and it’s surrounding that include East Tambaram, Selaiyur, Mudichur, Madambakkam, Sanatorium, Ranganathapuram, MCC College, Samathuva Peryar Nagar, Medavakkam and many more. Life is all about living more. We will never let you hear less. Enjoy your daily jokes, official conversations, TV, music and other sounds of life seamlessly with Hearing aid centre in West Tambaram. We care for your well being. We are here to make you feel home in a medical ambience. Our friendly atmosphere will drive away your fear and establish everlasting relationship with our hearing care expert. You tests are performed in well established environments. A caring and respectful hearing aid store in West Tamabram. Book Appointment Now. Pure Tone Audiometry – often said as PTA is a behavioral test that measures hearing sensitivity. This test mainly helps in indicating the Pure Tone Thersholds (PTTs) – i.e., the softest sound audible to patient at most times is recorded. The results are provided in graphical representation. During this test sound are passed at various levels for frequency range-low to high. Book an appointment today – The finest Chennai hearing care clinic. Impedance audiometry – is a vital test to analyze the middle ear condition. Primary use: Tympanic membrane and middle ear status are determined through this test. Secondary use: to examine acoustic reflex pathways, that includes Cranial Nerves(CN) VII & VIII. Auditory sensitivity can be directly examined via impedance audiometry. A basic and fundamental testing for assessment of hearing-loss is Speech Audiometry. This test supports to detail information on the degree of hearing loss and type of hearing loss. In addition Speech audiometry helps to infer information on work understanding abilities and discomfort to speech stimulus. Get aided by the finest and best Speech Audiometry professional in Chennai. Book an appointment now!! SISI-Short Increment Sensitivity Index, is a test used to detect the smallest fluctuation in the intensity of sound. This test is used to analyze the presence of “recruitment” in an individual (i.e.,) the capacity to hear abnormal loud noise. TDT-Tone Decay Test, provides information on auditory fatigue. The presence of auditory fatigue is also observed in individuals with normal hearing. The phenomenon of hearing a tone whose intensity is slightly above absolute threshold of hearing and heard constantly only for 60 seconds is termed as auditory fatigue. A sound decay between 15 and 20 decibels indicates sign of cochlear hearing los. A sound decay more than 25 dB indicates damage on vestibulocochlear nerve. At Chennai, Hearing Aid Centre we cherish in providing you the best hearing aids from the worlds pioneers in hearing aid manufacture. Our hearing care experts will support and work with you to regain the best hearing. The brands dealt in our hearing aid store are ReSound, Oticon, Unitron, Phonak, Interton, Siemens/Signia & we can also provide other user specific hearing aid brands on needful basis. 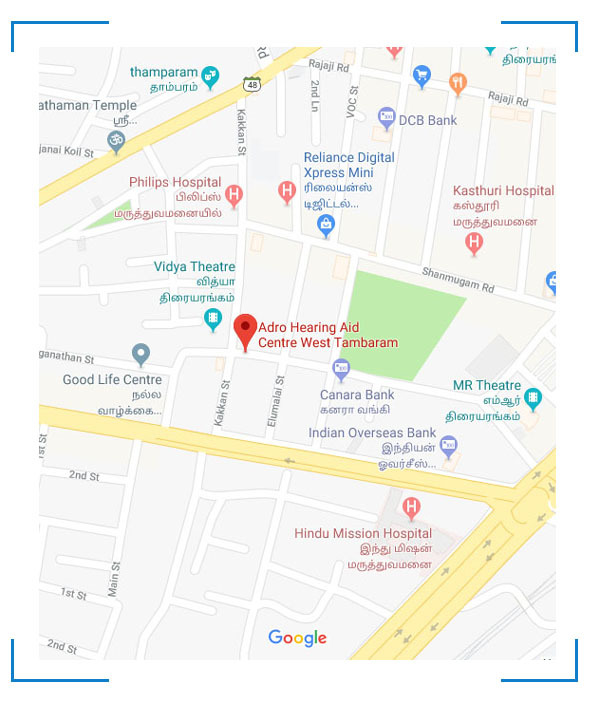 If you are from Chennai, Chengalpattu, Kancheepuram, Avadi, Ambattur, and any region in Chennai outskirts you can call our customer support for a free hearing aid trial at your home!! Our Hearing Aid experts are more focused on after care services. Digital hearing aid purchased by customers from our hearing aid store in Chennai and India can visit any of our stores and have the hearing aid adjustment to required hearing levels in timely intervals. We are known for providing personalized attentions to our customers in diagnostics, consultation, customized products and hearing aid adjustments. Customers who have purchased hearing aids from other centers can also visit our nearby hearing aid store and have their hearing aids adjusted by our experts. We are unique by providing promising long-term assistance to our patrons. The buyer-seller relationship doesn’t stand void post purchase. In-fact the bonding between our hearing aid centers and customers increase by excelling in our after care support. Are you looking for Hearing aid repair and service?? Please approach our nearby hearing aid store in Chennai and get the required replacement on priority. Hearing aid batteries from PowerOne, ReSound, Duracell. Brand specific Hearing aid wireless accessories such as TV streamer, Phone Clip, Micro Phone & Remote control.